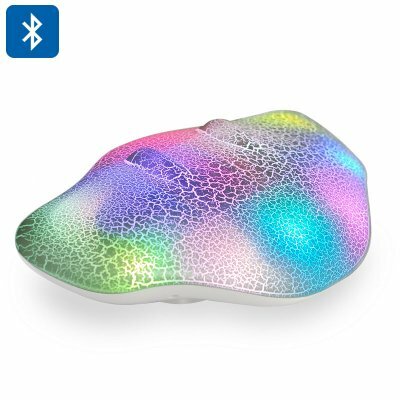 Successfully Added Manta Ray LED Bluetooth Speaker - 1800mAh Bluetooth Speakers, RGB LEDs, 32GB Micro SD Card Support to your Shopping Cart. Manta Ray Bluetooth speaker with LED lights sets the party mood with a light show to match your music. Connect via Bluetooth or use the 32GB micro SD card support for hours of musical enjoyment. Like the graceful Manta Rays that glide through the oceans this Bluetooth speaker has a sweeping design that encompasses its two powerful speakers. Its attractive look is heightened by the built in LEDs that will illuminate the body in different hues while playing music. This is as much a piece of art as it is a speaker and deserves a central location, so as you can truly appreciate the colorful lighting display that will accompany your music and impress your friends. The two speakers combine to bring 6 Watts of audio mastery to any room while the Bluetooth connectivity lets you stream music to it wirelessly via your phone, tablet or laptop. By gently tapping the top of the speaker you can skip tracks or adjust the volume of the music being played, even if it’s coming from your phone 10 meters away. This Manta Ray Bluetooth speaker has a built in 1800mAh battery that provides hours of music and visual lighting effects, great for relaxing at home or throwing a party. The LED Manta Ray Bluetooth speaker comes with a 12 months warranty. Brought to you by the leader in electronic devices as well as wholesale Bluetooth Speakers..